An example Eclipse project is available at the end of the post. This has been tested both on an emulator and a real device both running Android 2.0. This simple View child has three member variables: a String and an integer that will later be used to hold the custom values defined at the XML layout file. And also, the Paint object is being initialized. This object is responsible for setting the render settings in the Canvas. For this example, it will set the text to red (lines 13 through 17). Next, there’s the CustomView constructor, which is inherited from the View class and is the is the most critical part of this code (lines 19 through 32). 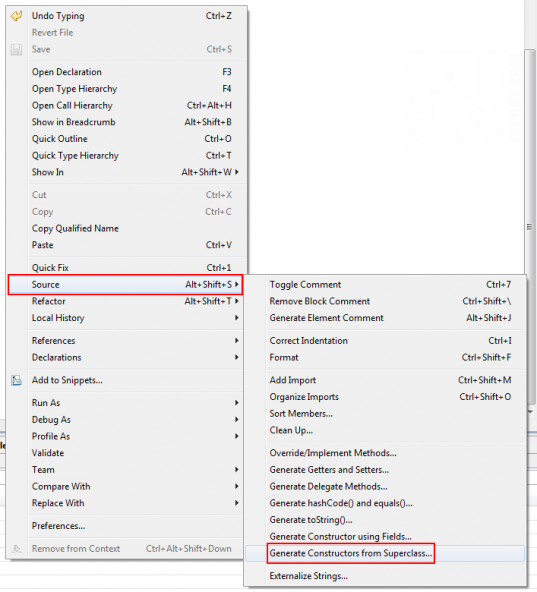 It’s necessary to implement one of the View constructors that takes an AttributeSet object as a parameter, otherwise it won’t be possible to inflate the CustomView from a XML file. In Eclipse, it’s a very easy task to accomplish, just right click anywhere inside the class and select Source->Generate Constructors from Superclass. A list of constructors from the View class to be implement will be shown; select the one that takes the Content and the AttributeSet objects as parameters. In the next dialog, select one of the constructors that takes the AttributeSet object as a parameter. The constructor also initializes the Paint object, sets its color to red, obtains custom fields from the layout XML file and stores then into the redText and value variables (lines 24 through 31). This custom fields are just attributes that can be added to the XML file and they hold just about any type of data we want. However, it’s wise to use only boolean, integer, float or string values as attributes, since methods to obtain these types of data from the layout XML are already available at objects from the AttributeSet class. In the above example, just take a look at lines 29 and 31, where, respectively a string and an integer are being obtained from the XML file and stored into member variables. There’s no reason to define an extended View class if it doesn’t display anything, so that’s the reason why this code also overrides the onDraw() method, which is responsible for the rendering. 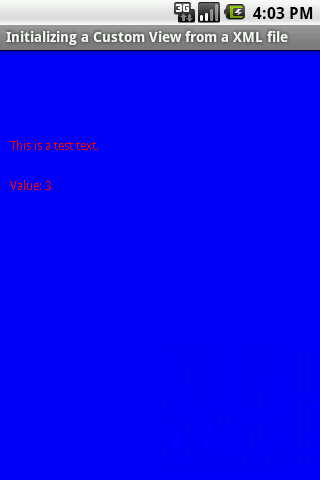 In this example, the string and the integer obtained from the custom XML attributes are being rendered on the screen using the Paint object. redText = "This is a test text." The only thing one needs to watch out for is not to forget to include the namespace and the package name and not just the class name. The custom XML attributes are being defined at lines 13 and 14.